The Akiles half moon calendar punch is designed so that you can quickly and easily add a half moon punch to your documents for use in binding calendars. This type of punch is primarily used in conjunction with twin loop wire binding and pre-formed calendar hangers. The half moon punch is normally centered along the binding edge of you calendar. The pre-formed calendar hanger is bound into the document with wire binding spines on both the left and right. Most other half-moon punches cost at least twice as much as this unit. However, the Akiles Half Moon Calendar Punch will offer you all the quality you need to produce short run calendars for your organization or for your customers. Looks good, but I have not used it yet and in order for me to leave a review on the other items, I have to leave a review on this. Welcome to MyBinding video. Let's take a look at the Half Moon Calendar Punch by Akiles. It's compact, easy to use, and the steel construction will last you a long time. The adjustable punching arm slides into the bottom and acts as a guide to make sure your punches are consistent throughout your project. The punch capacity of this half moon calendar punch is 20 sheets of 20lb paper and it punches just fine through most soft and hard PVC covers. This type of punch is primarily used in conjunction with twin loop wire wire binding and preformed calendar hangers to make calendars. But you'll find many more uses for it as well. That's the Akiles Half Moon Calendar Punch. For more demos, reviews, and how-tos, check out MyBinding.com. Making calendars can be fun, but to do so, you need the right tools. One tool you'll possibly need is the Akiles Half-Moon Punch. Here are this machine's strengths and weaknesses so you can learn all about it. The Half-Moon is a device that was designed to punch a semi-circular hole along the edge of your documents that are bound with twin-loop wire spines. Using this device along with pre-formed calendar hangers will allow you to produce calendars for a variety of purposes. This is a punch that's capable of working with paper and plastic covers. The plastic covers can be either hard or soft and can range in thickness from 0.8 mm to 1.2 mm. When you use this device, you'll be able to punch up to 20 sheets of 20 lb. bond paper at one time. This is a pretty good amount and will allow you to process all the pages of your calendar at once as long as the paper isn't too thick. The Half-Moon has an adjustable punching guide that will enable you to get the results you need for the type of paper you're using. The device is nice and compact. It will easily sit alongside the other items on your work surface so it will always be within reach. This punch is perfect for organizations that need a device for occasional use. The Half-Moon can beautifully handle small runs of about 100 calendars or less. Also, the Half-Moon is one of the least expensive devices of its type currently available so it's great for companies and individuals who are on a budget. As mentioned above, the Half-Moon is well-built and you'll be able to get a lot of use out of it before the die wears out. Unfortunately, when the die wears out, that's the end of it since you can't purchase additional dies for it. So you'll really want to think about how much you'll be using this punch before purchasing it. This is a handheld device so you may find that your hands get worn out after you've used it for a while. Also, if you don't have the appropriate binding machine with which to bind your calendars, you're going to need to invest in one. Overall, the Akiles Half-Moon Punch is a must-have device if you already have a wire binding machine and you're interested in making your own calendars. It's a small device that's easy to use and it has a good punching capacity so you'll be able to punch an entire calendar at once. And while it's durable enough for occasional use, keep in mind that the die cannot be replaced. Because of this, the Half-Moon is ideal for people producing short runs of calendars. 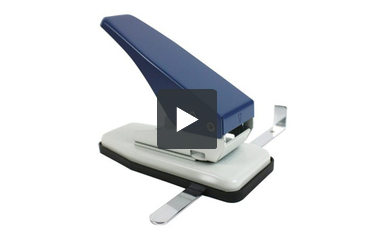 Finally, this device is affordable and would be a great addition to a wire binding machine. So check this item out today to find out if it's right for you. what diameter hole does it punch out ? Thank you for your question. The Akiles Half Moon Calendar Punch with Guide punches a half moon with the diameter of 21mm. I'm from Vadodara i. e. in western India. How do I get your Half Moon Calendar Punch in India? Thank you for your question. We ship internationally. If you put items in your cart and view the cart, you can enter your country and postal code to get the shipping cost.